In the early 1900s, a stock trader named W.D. 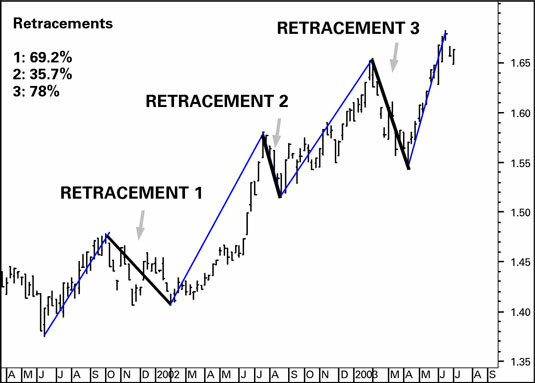 Gann discovered that retracements in the securities he was trading at the time tended to occur at one-half of the original move from the low to the high. In fact, Gann said that the most profitable retracement is a 50 percent retracement. To illustrate, say the price of a stock moved from $10 to $30. At $30, the crowd decided that the security was overbought and started to sell. The ensuing price decline, the retracement, stops near 50 percent of the original $10-to-$30 move, namely $20. This chart shows the 50 percent retracement case. The area around 50 percent is a danger zone, because the price can keep going and become a full-fledged reversal around there (in which case, you lose all the gains). But it’s the best place to reenter an existing trend (with an exit planned just below using a stop-loss order in case it doesn’t work). Gann also saw retracements occurring at the halfway point of a move, such as 25 percent (half of 50 percent), 12.5 percent (half of 25 percent), and so on. Statisticians can’t offer proof that retracements occur at 12.5 percent, 25 percent, or 50 percent with more frequency than chance would allow because defining the low-to-high original move and then defining the stopping point of a retracement is a computational nightmare. No matter what definitions a statistician gives his software, another analyst is sure to want to refine them in some other way. You’ll see studies, for example, showing that the actual percentage change of many retracements isn’t precisely 50 percent, but rather in a range of 45 to 55 percent. Should you accept a minor retracement of 45 percent but not a major one that correctly predicts a trend resumption at 44 percent? 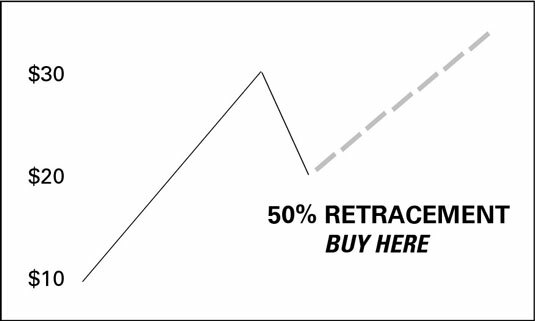 A critical point about the 50 percent retracement rule is that you may think you want to exit to protect your profit at the 50-percent level. If you bought the security at $10 and it rose to $30, but has now fallen to $20, shown in this figure, you want to sell at $20 to hang on to the gain you have left. But if the 50 percent retracement rule works this time, you would be getting out exactly when you should by buying more (adding to your position) because a resumption of the trend at the $20 level almost certainly means that the price will now go higher than the highest high so far, $30.